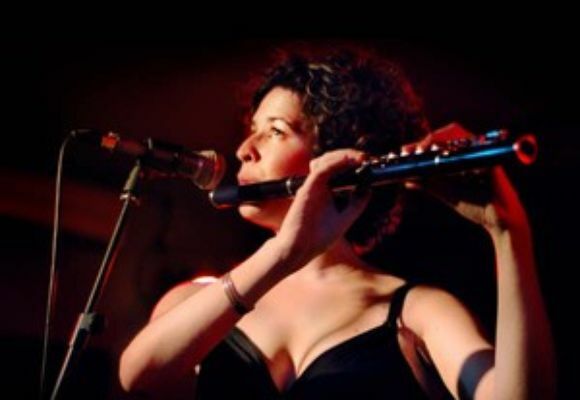 Hadar Noiberg is one of the most versatile and influential flutist, composer and arranger based in New York City. With a language that transcends her Middle Eastern roots, Hadar seamlessly fuses styles reminiscent of many different cultures making her voice one that is highly distinctive and innovative within the modern world music scene today. Since a young age she has performed and toured with the Young Israeli Philharmonic Orchestra and arranged for numerous Jazz ensembles. Later she studied composition with the acclaimed David Del Tredici, achieving the honorary ASCAP scholarship for composition. Noiberg leads the all star Cuban-African group Charanga Soleil and is featuring with the top Cuban bands and artists in New York City. She is performing and touring nationally and internationally showcasing in such venues and festivals as Blue Note, Iridium, Jazz Standard, Dizzys Coca Cola, Sweet Rhythm, Smalls Jazz Club, Merkin Hall, 55 Bar, Creole Blues Festival, Michigan Womyns Festival, Mid Summer Night Swing Festival just to name a few. Hadar has featured with some of the most acclaimed artists such as Dave Valentin, Anat Cohen and the Choro Ensemble, Coco Mama with Mayra Casales, Omer Avital, Alvester Garnett, Joel Frahm, Rufus Reid and many more. Noibergs new project Connections explores her own musical roots combining traditional influences within a contemporary format.